Villa Mochlou Dyo the twin sister of “Villa Mochlou”, offers an equally breath-taking view, hospitable and functional areas swarmed in shrubs and flowers. Villa Mochlou Dyo the twin sister of “Villa Mochlou”, offers an equally breath-taking view, hospitable and functional areas swarmed in shrubs and flowers, where you can enjoy exquisite moments of serenity and relaxation and a spacious elevated veranda, with a large marble table great for your breakfast, any meal or drinks, while you gaze at the endless blue and the faraway promontories, lose yourself in reverie and totally unwind. The large swimming pool, inside the enclosed area, will cool you down when you feel like it, and you can bask in the sun on the comfortable lounge chairs. 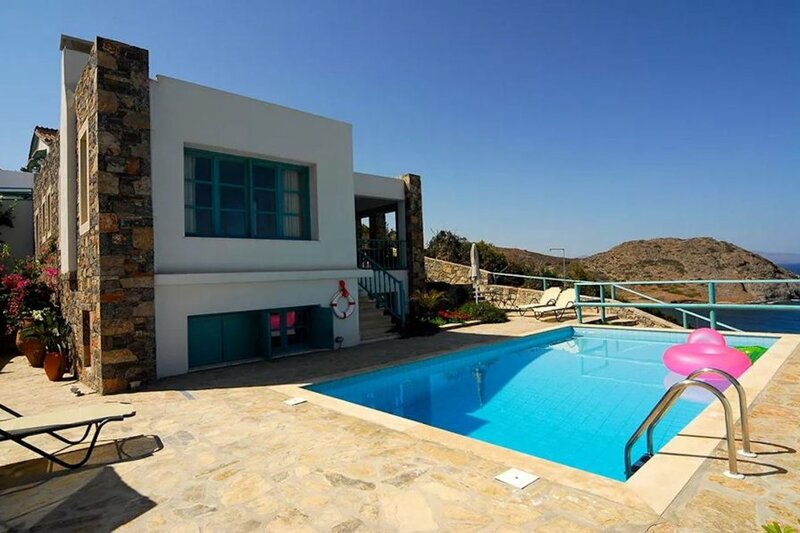 Villa Mochlou Dyo also has a large indoor area that expands over two stories connected by both interior and exterior staircases. It features four double bedrooms (two on the ground floor and two upstairs) and an open-plan area with dining room (with cooking area) and living room (where one of the sofas can be used as bed). Upstairs features a spacious sitting room with a view to the sea and the beautiful surrounding landscape. The sitting room is coloured in light shades and its furniture design is inspired by the Cretan tradition. The southern side of the open-plan sitting room is reserved for the kitchen, similarly coloured in light, joyous shades, and fully equipped, as described below. This level has two double bedrooms; one of them with private WC and another larger one, with a view to the sea, access to the veranda, and a central bathroom, fully equipped, with a Jacuzzi bathtub and marble surfaces. There is also a spacious veranda with a splendid view of the open sea, the small Mochlos lush valley and the surrounding hills and mountains. An internal staircase from the open-plan sitting room/kitchen leads to the lower level, which features two double bedrooms and a likewise decorated and fully equipped bathroom of the same quality and painted in similar shades. The villa is completely autonomous and detached; it ensures full privacy and has private outdoor areas, verandas, yards and garden, its own swimming pool and parking space.